Impressions from our cycling trip on the beautiful isle of Corsica in May/June 2010. We cycled around 800 kilometers from Bastia along the coast to Calvi and Porto and then through the inner highlands to Corte and back to Bastia. You can watch our video-report! For more information you can visit our website: fietsenineuropa.nl. The last tour of the season - that is if the weather cooperates. The plan is as simple as it is elegant. We take the train from Munich to Landeck in Austria. From there it is a short bus ride to Nauders near the top of the Reschen Pass and the border to Italy. That saves riding in unpleasant traffic, not to mention a hefty climb! From Reschen in South Tyrol it's downhill (almost) all the way. An all-day train ride takes us from Munich to Morlaix in Brittany via Paris. 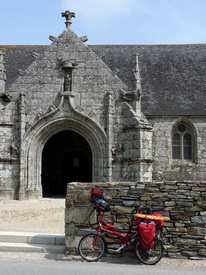 The train from Paris to Morlaix doesn't take bicycles and we are again happy to have folders. Our tour starts with an abundance of rain and hills as we follow Brittany's spectacular southern coast to the Loire. From here we cycle the popular - and flat - Loire Valley Bike Path into Burgundy where the scenery gets more interesting as we ride along the Canal du Centre and Saone River. After having covered approximately 1,500 km we take the train from Dijon back to Munich. We are Anna & Maurizio and We cycled Corse above the sea following some narrow road carved on the rock as ''Route Departementale'' 81, 81a, 80 that represent some of the most scenic paths a cyclist may hope to find. Spectacular views of the West Coast and Cape Corse. And at the end of the holiday We went in Provence and We summited Mont Ventoux. This is a description of my nine-day solo trip, in May 2010, in the Cévennes mountains of France. The trip was mostly camping, but no cooking. My goal was to see the Cévennes, mountains full of history and culture, their geography older than the Alps or Pyrenees. There was a good mix of climbing, mountains, medieval towns, villages, rivers ... always gorgeous and fun riding, but not a very high mileage. I wanted to learn something of the area, its culture and history, without being totally exhausted. In all it was about 300 miles, about 14,000 feet of climbing. I rode from Montpellier to Albi, with a loop up the Gorge du Tarn and down the Gorge du Jonte. Extremly good weather called us to another late fall tour. By train to Retz and further with the 'Reblausexpress' to Drosendorf. Starting late, upon arrival at Drosendorf, we have been heading for Karlstein, whereas we had our lunch. Then we have been riding to Waidhofen an der Thaya. A hidden beauty... Continuing to Zwettel, were we had our night. Zwettel a 'silent' city. Day distance 90 kilometers only. The next morning has been frosty... As nice Zwettel was for a stay, to leave is strange: just high frequent highways The good thing: we hit the Kamptal dam in fall - a wonderful landscape picture has been our award! We have been heading for Krems. Luch at Senftenberg. At Krems we found access to the well known Danube valley bike path. We followed this way down to the suburbs of Vienna. Last stop: Greifenstein (whereas we have been entering the train again...). This days distance: 122 kilometers. Enjoy the pictures! Good luck to all the followers! A tour to the North Country... (were the winds hit hard the border line...) Hardegg, known as Austria's 'smallest city', was worth to go... I believe, we have been lucky catching the very late end of summer... The tour leads us to the North border (Czech) - only a pedistrian bridge is open for traffic. A romantic side way leaded us to Ciszov. There was a monument seen: The last piece of the 'Iron curtain' - see pictures. Thanks god this time has passed. We had a wonderful lunch at the city of Znojmo. Then, after, some good Czech beer, we travelled home (by bicycle of course) on sideways to Retz. To early to enter the next train back to Vienna... So, we followed the road to Hollabrunn and in the next Minute we caught at a train to our home, Brunn am Gebirge Overall distance of our day ride: 80 kilometers Enjoy the pictures! Good luck to all the followers! We flew to Keflavik Airport , cycled to Grindavik than to Geysir and Gulfoss. Followed the Kjölur route through the highlands and continued to Akureyri and the famous Myvatn area. From there we traveled to the the east coast. From there we continued by bike along the rainy south coast back to Reykjavik. This blog is the record of a cycle touring holiday in Tuscany during September 2010. The trip included Volterra, Siena, Pienza, Montepulciano and Cortona. Extensive use was made of secondary roads including strade bianche. The blog should be read in conjunction with the planning information that is in this wiki http://holidaykeogh.pbworks.com/ and more photographs that are in this Flickr set http://www.flickr.com/photos/patrick_keogh/sets/72157625071265988/. Gerade erst fertiggestellt: Die französischen Teilstücke des Eurovelo-Radweges 6 von Basel nach Nantes. Mit großem Aufwand wird er beworben, schließlich ist auch offensichtlich viel Geld in diese Verbindung gesteckt worden. Da wir (2 Personen) den westlichen Abschnitt der Loire ab Orleans schon mehrmals gefahren sind, ist diesmal Basel nach Besancon dran. Die Strecke entlang dem Rhein-Rhone-Kanal und dem Doubs soll schön sein. Besancon wird in allen Reiseführern gelobt. Die Realität weicht dramatisch davon ab. In other words, I have done the tour alone... Heide, my spouse decided to went to her job, and... a lot of bike comrades didn't follow. I assume the didn't believe on the remain of the good weather. The Pielachtal circle has been 100 kilometers in total. Starting nearby Sankt Poelten (Austria). Enjoy the pictures! Good luck to all the followers! Well, I have participated this tour 4 times. [...] It is partly a race. The Norwegian teams are very strong. They do the distance of 540 kilometers in less than 14 hours, which results in an average of round 40 kilometers/hr. Keep in mind: the big teams ride in groups and do not like others to take advantage of the group. I learned quickly, as one of a group rider pushed me out of road. My warning 'if you do it again...', was not heard. He repeated: 'if you quarrel, we are forty, if like to can discuss it with all our tour guys...'. No way! Stay out of teams! This describes our nine day family tour around Western Brittany starting in Gouarec on the Brest-Nantes canal. We did about 30 miles day carrying our own luggage and staying in small hotels and bed and breakfasts. My wife and youngest daughter were on a borrowed tandem and my older daughter and I were on our own bikes which we brought from home on the roof rack. We had various people tell us that Brittany was flat or hilly and we didn't really know what to expect but take it from me it was hilly. Overall we had a great time. I spend this year my spring break in Corsica. An ideal country to test my new Cannondale bike with electric components from Bionx. (Motor, battery and display). A mountainous island, big enough to cycle around a fortnight. By train, I'll go from Zurich to Livorno. A ferry of ``corsica ferries'' will take me to Bastia. Here I begin to circle counter clockwise around Corsica. First I'm going up to Cap Corse, then via Saint Florent, Calvi, Porto, Ajaccio and Sarténe to Bonifatio, the very south of the island. Northbound I'll spend a few days in the inland mountains. From 05th. to 20th. July 2010 we cycled through the Netherlands. We had exceptionally good weather. (25 ºC to 39 ºC) On day 8 a violent thunderstorm, which doesn't occur every year, forced us to search for a shelter half an hour. Even fire brigade, Police and ambulance were mobilized. Trees were uprooted and in the neighbouring village, caravans were literally whirled through the air and landed in a pond. Lana has become our standard fall tour. This time, we have convinced some guys from our bicycle gang to follow us... Climbing the Mendel pass (Menapaces training pass...) as well as the passo Pallade (with a rather long downhill to Lana = 18 kilometers). And a car free day at Stelvio rounded our efforts... Enjoy the picture! Good luck to all the followers! Again Lana... Lana has become another standard tour. This time we concentrated on Passo Lavazze and the Passo Timmelsjoch.... Enjoy the picture! Good luck to all the followers! Lana again... has become another standard tour. As Lana is located so central, like a big gate to well known summits, like Passo Mendola, Passo Palade (Gampenpass), Passo Lavazze, Sella Ronda, etc. This time we tried hiking beside biking.... Enjoy the pictures! Good luck to all the followers! Lana has become another standard tour. As Lana is located so central, like a big gate to well known summits, like Passo Mendola, Passo Palade (Gampenpass), Passo Lavazze, Sella Ronda, etc. This time we tried a short trip to the Passo Stelvio. Enjoy the picture! Good luck to all the followers! Lana, has qualified to be a standard location, we visit every year end of August, begin September... A wonderful place! Bicycling is like to play in a huge fruit garden. Nobody cares, if you take an apple for refreshment... Lana has the advantage of beeing near to the Passo Mendola, it lays on foot of Passo Palade (Gampenpass). Nearby the city of Meran, with a lot of cultures opportunities, e.g. Gardens of Trautmannsdorf. From Lana you may reach the beautiful Passo Lavazze with a 18 % steep climb, and the Sella Ronda. Moreover at Marlings you may reach the train, which can lead you to Spondinig (close to the entrance of the Stelvio Road) and Mals (close to the Passo Rescia). Enjoy the pictures! Good luck to all the followers! Some guys went down to Cesenatico by car, we joined them... Cesenatico is nearby Rimini, with a very good gastronomic infrastructure. This people are prepared to welcome bicyclists. The surroundings of Cesenatico are scenic: San Marino, Nove Colli and more... A good and rather cheap training place in spring time... This has been more a bicycle club oriented tour. Enjoy the pictures! Good luck to all the followers! This Tour is not so far from our home... The city of Gmünd may get reached in a day ride (round 200 kilometres). We pedalled via the city Krems on Danube, the Krems river Valley North to the city of Zwettl. At Zwettl a wide range of gastronomic offers awaited us. Travelling further to the city Weitra another highlight has been hit: a local brewery. At Gmünd, just before the Czech boarder we found a hotel. The very next day, we have been riding South to the river Danube. It has been so hot, as our bike tire has been gluing to the melted asphalt... Nearby the Danube, at Waldhausen we found a natural public bath. Right in the in the dam area of the local river. Refreshed we continued. Passing the well known Wachau. Night at a little hotel at Spitz on Danube. Riding home was easy from now on... Enjoy the pictures! Good luck to all the followers!